The 2012 Africa Cup of Nations Final was a football match that took place on 12 February 2012 at the Stade d'Angondjé in Libreville, Gabon, to determine the winner of the 2012 Africa Cup of Nations, the football championship of Africa organized by the Confederation of African Football (CAF). This stadium is only a short distance from the spot where most of the Zambian national team died when their aeroplane crashed in 1993. It was contested by Zambia and Ivory Coast. The kickoff time was delayed by 30 minutes to 20:30. 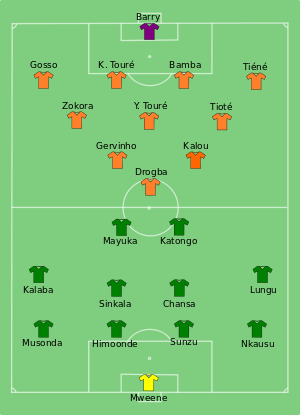 Zambia won the title for the first time by beating Ivory Coast 8–7 on penalties. This was the third appearance in the final for Zambia; the "Copper Bullets" lost in 1974 and 1994. After a surprising start and a win over Senegal, they drew with Libya before winning the deciding match against the host Equatorial Guinea and winning the group. In the quarterfinals they won 3–0 against Sudan and shocked Ghana as they defeated them 1–0 in the semifinals. Both Christopher Katongo and Emmanuel Mayuka scored three goals in the first five matches to help Zambia to reach the final. The match was an emotional one for Zambia, as the stadium in Libreville was just miles away from the site of the 1993 Zambia national football team air disaster, in which 18 players were killed. Ivory Coast also appeared in their third final. They won it in 1992 and lost in 2006. The "Elephants" had gone through the tournament so far without conceding a goal and winning all of their matches. It started with a victory against Sudan, followed by two wins against Burkina Faso and Angola, the latter one without some of the best players. The quarterfinal was won against co-host Equatorial Guinea, before Mali was beaten 1–0. Didier Drogba joins Katongo and Mayuka with three goals himself at the top of the goalscorers. ^ "Africa Cup of Nations: Zambia win dramatic shoot-out". BBC Sport. 13 February 2012. Retrieved 13 February 2012. ^ "Spot-kick drama secures fairytale title". ESPN Soccernet. 13 February 2012. Retrieved 13 February 2012. ^ "Zambia gain redemption to stun Ivory Coast in Africa Cup of Nations". Guardian UK. 13 February 2012. ^ "Zambia shock Senegal to go top". cafonline.com. 22 January 2012. ^ "Libya hold Zambia in four-goal thriller". cafonline.com. 25 January 2012. ^ "Zambia tops Group A after beating Equatorial Guinea as both make quarter finals". cafonline.com. 29 January 2012. ^ "Zambia humble 10-man Sudan to reach last four". cafonline.com. 4 February 2012. ^ "Zambia shock the Black Stars". cafonline.com. 8 February 2012. ^ "Cote d'Ivoire sweat past Sudan". cafonline.com. 22 January 2012. ^ "Elephants trample over Stallions to seal quarters place". cafonline.com. 26 January 2012. ^ "Angola goes down to Ivory Coast and miss out on quarter final place". cafonline.com. 30 January 2012. ^ "Ivory Coast through to semis after beating hosts Equatorial Guinea". cafonline.com. 4 February 2012. ^ "Ivory Coast through to the final to play Zambia". cafonline.com. 8 February 2012.